Quite often, people acquire for entertainment joysticks for laptops and computers. It is needed for comfortable gameplay. However, just to buy such a thing are many, but to correctly adjust not everyone can. Very popular is the analog joystick of the aircraft type. It is not easy to properly connect and calibrate. In stores you can find variety of steering wheels and digital multi-button controllers, but they are not very comfortable to control the plane in the game. There are also programmable digital joysticks. They are attracted to its versatility, but is more expensive. 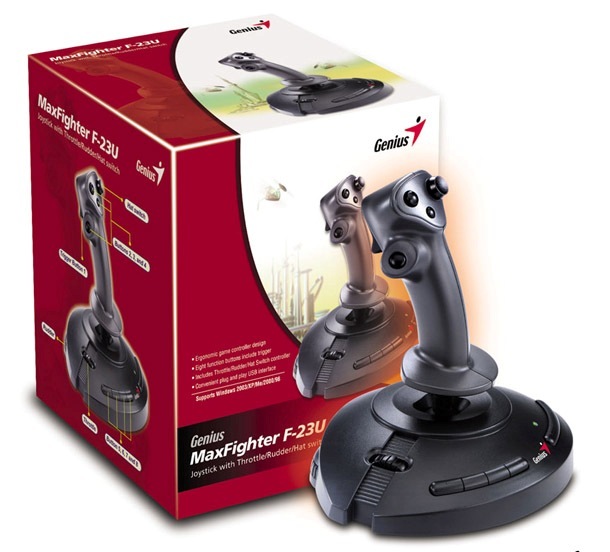 Of analog sticks, special attention should be paid to Genius Flight2000 F-22 from the company KYE Systems Corp, which has almost all the features. His arm is very similar to the handle, which uses the newest American fighter F-22 the company "Lockheed Martin". The player can experience the same feeling as fighter pilot. The right hand need to control the arm, which is also mounted the fire button to a trigger, and three additional buttons. In the game they can perform different functions. With the help of additional buttons often produce switching of weapons and shuffling purposes. Almost any game you can change the button assignment on your own. Next to the buttons on the handle set the four position direction switch review. It can be used to direct the view of the pilot forward, right, left and back. With the keyboard during combat is hardly possible to look around. To connect this analog joystick no need to install a different driver. An obligatory condition is the presence of a game port. It is usually available on sound cards. If it's not there, look for on the boards of ports of input-output, which was used in 486's and older machines. Turn off the computer. It should be done carefully when connecting any cables. Back on the system unit, locate the game port. He is a connector in which 15 pins, arranged in two rows. In size it is little more than a serial port for the mouse. In this slot you need to plug the cable from the joystick, and then turn on the computer. The connection is made.